As part of its expansionist neo-Ottoman agenda, the government of Turkish President Recep Tayyip Erdogan has been building mosques and setting up Islamic educational institutions around the world. The mosque that Ankara is currently constructing in Tirana, Albania, will reportedly be the largest of the dozens of its mosques in the Balkans. 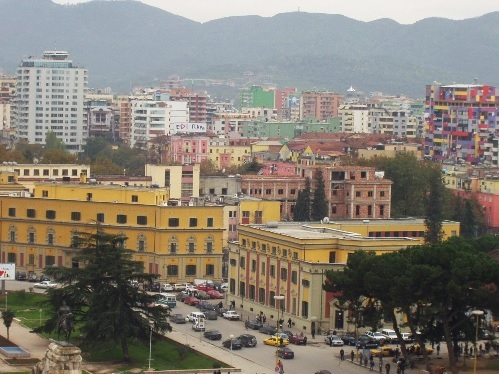 Through the Maarif Foundation — established in 2016 by means of a law enacted by the Turkish parliament, which gave it the authority to open schools abroad — a kindergarden, primary-, middle- and high-schools were built in Tirana. In October 2018, Turkish Foreign Minister Mevlüt Çavuşoğlu was the keynote speaker at the inauguration in Albania of the Maarif-run University of New York Tirana. Maarif (“education” in Arabic) is a well-funded institution whose income comes from the Turkish government as well as from private donors, among other sources. Four members of its board of trustees are appointed by Turkey’s president and three by the Council of Ministers. Its seven permanent members are also government employees. According to its official website, Maarif runs 257 schools in 58 of the 95 countries it has approached. Turkish media reported in December that Maarif completed the process of turning 145 schools in the world linked to Islamic cleric Fethullah Gülen — whom the Turkish government accuses of organizing the 2016 failed coup — into Maarif-run institutions. On January 15, Maarif signed a cooperation agreement with the Diyanet, the Turkish government-funded Directorate of Religious Affairs — which has built dozens of mosques worldwide — to work together on educational and cultural matters. The Turkish government appears to attach special importance to the Balkan states of southeastern Europe, a region that the Ottoman Turks conquered and ruled from the 14th to the early 20th centuries. Thus far, the Maarif Foundation is active in Albania, Kosovo, Bosnia-Herzegovina and the Former Yugoslav Republic of Macedonia (FYROM). It is also slated to open schools in Romania this year. Kabaktepe also serves as vice president of the Istanbul-based, pro-Hamas Cihannüma Association for Solidarity and Cooperation Platform. At a Cihannüma-sponsored event last April, Hamas leader Khaled Mashaal delivered a speech in which he thanked Turkey for “making a significant contribution to reintegrating Palestinian territories into Palestine again.” The event was organized jointly with the Istanbul-based Association of Jerusalem and our History” (KUTAD). KUTAD is headed by Jihad Ya’amur, a Hamas terrorist who was involved in the 1994 abduction and murder of Israeli soldier Nahshon Waxman. Kabaktepe previously sat on the board of Turkey’s IHH Humanitarian Relief Foundation, a pro-government Islamist organization that has been accused of smuggling arms and dispatching jihadists to places such as Syria, Pakistan and Afghanistan and of financing Hamas, under the guise of charity for Gaza. Kabaktepe is also a senior consultant — along with Erdogan’s son, Bilal — for the Turkey Youth Foundation (TÜGVA), an Islamist group that aims to “support and educate Turkish and other Muslim youth” in and beyond Turkey. Kabaktepe frequently lectures university students at TÜGVA’s “academic camps” on issues related to political Islam. "Islam is the most superior. Muslims are the most superior. That is what the [Koran] says." "...[J]ihad is obligatory until judgment day... in some places, jihad is done with the pen; in others it is done with the tongue. And in some other places, it is carried out with guns. What is your jihad in the lands where you reside? If Muslims are persecuted somewhere, it is because there is no caliphate where they live." The Maarif Foundation, it seems, is using education as one form of jihad. "[Turkey's] continued penetration in the Balkans -- using religion as a way in... should be of particular concern to Western powers."